Timphu, Bhutan -- It's not yet 8 a.m. and the sacred monk dances won't start for another two hours. The sun begins to glare mercilessly. There's no shade to hide in. But the vast, brick courtyard of the fortress-like monastery is already packed with the faithful wearing colourful traditional costumes. 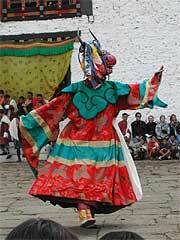 << A monk dancer swirls about in a dance to purify the grounds for the arrival of Guru Rinpoche. It's tsechu time again in Thimpu, the capital of the Himalayan kingdom of Bhutan. Time to watch the monks dance. For those not familiar with the Tantric Buddhism of Tibet and Bhutan, the notion of monks dancing may strike one as unthinkable, even improper. With an open heart, however, the monk dance festival in Bhutan can become a spiritual experience that helps one to understand that the paths to the Lord Buddha's teachings may be different, but the goal is unmistakably the same. Nestled in the Himalayas, the abode of gods in much of Asian mythology, Bhutan is often romantically described as the last Shangri-la. The Himalayan kingdom's out-of-reach image has also been reinforced by strict tourism policies that are aimed to protect the kingdom's pristine natural and cultural identity. That is why tourists, who must dig deep into their pockets if they want to travel to Bhutan, most always time their trips to coincide with the kingdom's famous monk dances. In Thimpu, the annual four-day tsechu religious festival features a series of sacred mask dances performed by monks and laymen in mid-October. Other towns hold their own tsechus at different times of the year. The festival is a continuation of the kingdom's ancient religious rites that date back to the 9th century when Guru Padmasambhava, or Guru Rinpoche _ the second Buddha in Tantric Buddhism _ introduced Buddhism to Tibet and Bhutan. As visitors watch, a monk and male lay dancers wearing gigantic masks and headgear swirl about in colourful brocade costumes amid the thundering sounds of cymbals, horns and drums. Viewers know they are witnessing a rare, special glimpse into a living ancient culture where powerful religious faith still dominates all aspects of the people's everyday life. Apart from giving moral teachings, the stories in the dances tell the story of Guru Rinpoche and the history of Tantric Buddhism in the land-locked Himalayan kingdom that is still little-known to the outside world. For example, the Dance of the Four Stags tells how Guru Rinpoche subjugated the deities of the natural world and absorbed them into the Buddhist system. This helps shed light on the syncretism of animism and Buddhism in Bhutan, which is also reflected in other masked dances. The Dance of the Stags and the Hounds tells how Milarepa, another important religious figure, succeeded in converting a hunter, who represents the indigenous inhabitants, from animism to Buddhism. The Dance of the Raksha and the Judgement of the Dead, meanwhile, derives from the Book of the Dead, depicting what awaits us after death. It's a visual feast. A photographer could only dream of capturing such magic. But for the Bhutanese, it's essentially a spiritual experience. For the monk dancers, the dances are not mere dances, but deep meditative experiences that temporarily make them one with the deities they are representing. It is said that the dances steps were not invented, but are rather reproductions of celestial dances that meditation masters have witnessed during deep meditative trances. The dances are also a way for the monks to share with the faithful their heavenly glimpses as well as merits gained from their meditations. That's why, for the Bhutanese, going to a monastery for the monk dances is more than a social gathering: It's their entering into a magical realm where celestial blessings will protect them from all harm _ until the next year's tsechu comes around. According to Lama Mynak R. Tulku, a prominent monk in Bhutan, the sacred dances in the courtyard of the fortress monastery are the culmination of the monks' long meditative preparations. And the rituals don't end when the tsechu ends. ``To prepare themselves, the monks must spend at least one or two weeks praying and meditating,'' says the monk in a saffron robe. While practising the steps or during the actual dance itself, the monks must recite a mantra to maintain their meditative state, he said. 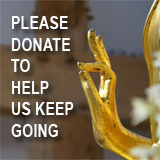 Since visualisation is central to Tantric Buddhism's spiritual practices, the monk dancers not only dance, but also meditate and visualise until they become one with the deities they are representing; this allows them to sanctify the surrounding environs with their now magical movements and powers. When the four-day dance festival climaxes with the Dance of Eight Manifestations of Guru Rinpoche, members of the audience, ranging from royalty and high-ranking lamas to farmers, believe they are indeed in the presence of the Second Buddha, who is there personally to bless them and give them a glimpse of heaven. When the sacred dance festival is over, the monks must perform additional religious ceremonies. 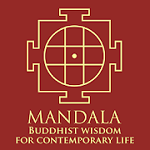 This includes dismantling of the sand mandala (a reminder of the truth of impermanence), disposing of the sacred sand in the river and performing cake-offering ceremonies to the deities. While watching the monks dance, it helps to understand religious symbolism in order to fully appreciate what would otherwise could be a series of long, mind-numbing and repetitive dances alternating with noisy commotion. Although not all the dances are performed by monks, symbolism abounds in all of them. The use of force to subjugate demons, for example, symbolises a ferocious determination to subdue one's fierce ego. The sword symbolises the wisdom that destroys worldly attachments. The evil spirits are caught by the hook of compassion. The noisy commotion symbolises our noisy mind and the whirlwinds of emotion that need to be replaced by inner calm, represented by slow, silent dance movements. The sacred monk dances are also in line with the beliefs in Bhutan's Tantric Buddhism, that one can be liberated by ``seeing''. Tantric Buddhism in Tibet and Bhutan teaches that the faithful can be spiritually liberated by seeing, hearing, being touched by the blessed ones, by tasting sacred substances and by transcending one's thoughts. For ordinary Bhutanese, seeing the sacred monk dances or seeing the huge sacred religious painting called thondrol, briefly unveiled at the end of the tsechu in some towns, offers a ``liberation by sight'' which they believe can wash away sins. For the monks, the dances are part of their meditative visualisation practice so that they can transcend the duality of good and bad, ugly and beautiful, likes and dislikes, to reach a pure state of mind, which they believe is everyone's true nature. Although some of the religious symbols and practices in Tantric Buddhism in Bhutan may strike Theravadan Buddhists as bizarre, the seemingly different paths aim toward the same goal. Still, the question remains: Can we really be spiritually liberated through mere seeing? As the merciless sun gives way to a cloudy sky in the late afternoon, many young Bhutanese men and women stand in a long queue to receive a blessing from a statue of Guru Rinpoche who is, to their way of seeing things, personally present for them. The young mothers temporarily stop breast-feeding their infants so that the ``atsara'', or festival jesters, can take the babies to receive a blessing. Is it all blind faith? In the magical moments as grandpas and grandmas stare fixedly at the sacred dances while they pray on their rosaries, unperturbed by the commotion and the savage sun, that question doesn't seem to have much meaning.